Merely the thought of eating off a chocolate fountain is mouth watering to most of us mortals. The heavenly delight in chocolate’s liquid state flowing through a fountain is nothing less than a fairy tale fantasy come true. When something sets hopes so high, you just have to make the experience perfect; and to make the experience of a chocolate fountain perfect, you need to pay attention to a few areas while setting it up at your event. We give you a quick list of seven important things to consider when choosing a chocolate fountain. The ideal location is a place that is clean, sturdy, safe, and sufficiently warm to keep the chocolate flowing. Avoid keeping your chocolate fountain directly under the AC, as the low temperature may cause the chocolate to harden, preventing it from flowing smoothly in the fountain. Outdoors is generally not a good choice either, unless you are absolutely sure of the weather being tranquil throughout the party. You can choose both milk and dark chocolate varieties for your fondue. But for it to flow gracefully on a fountain, you will need to take into account the quality of the chocolate you are using. It is best to use chocolates with a high content of cocoa butter. Else, you may need to use vegetable oil (about ½ a cup for every five pounds of the chocolate) in order to ensure the right consistency. Cold apparatus in an air-conditioned room is not the best setting for your chocolate fountain. To make sure that chocolate remain in its sensuous molten state, preheat the fountain before putting in the chocolate. You don’t want to spend your time working at getting the fountain right, instead of entertaining your guests! Many a times these splendid fountain fondues require a bit of touching up, especially if you are going in for a big one. The supervisor can also ensure hygiene of the chocolate fountain throughout the event. Constantly monitoring the fountain, refilling chocolate, arranging the dips and greeting guests are the services that you can expect from a supervisor. Strawberries, marshmallows, cookies, melon balls, fudge and dipping chilies are a few items that make for scrumptious delights when used as dips in a chocolate fountain. Arrange for a brilliant dips menu to make the most of your investment in the chocolate fountain! However, do not include any wet or crumbly items: moisture from wet food can spoil the chocolate, while crumbles tend to scatter and make your fountain look less graceful. Since the chocolate fountain is going to be on for a long time and all your guests are going to be dipping their food off it, it becomes extremely important to ensure hygiene. Place it in a clean area, preferably indoors; and hire the fountain from a professional who has a food hygiene certificate. Putting up chocolate fountains and ensuring that things go well while you enjoy your fondue treats is best done by experts! Don’t risk your party by going in for just any chocolate fountain owner. Go for a professional who knows all the nuances of their job. A chocolate fountain can enliven any event. But to make it work, you need to set it right. 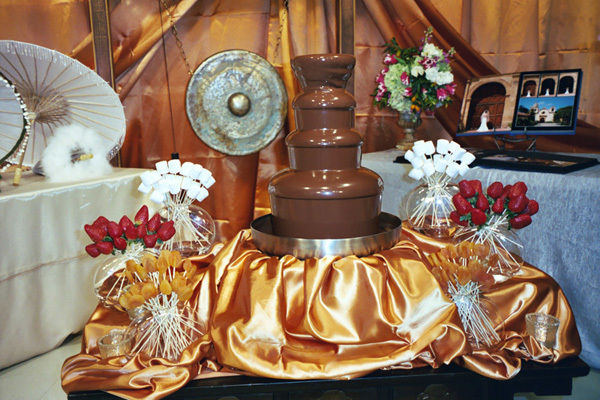 Keep the above points in mind, and you will derive maximum joy and fun out of the fountain of chocolate at your event!